When you’re looking for a sold-out limited Dollfie Dream or a good bargain, the secondary market is your best bet. That means buying from shop or forum online, instead of getting a new doll directly from the manufacturer or a licensed retailer. This guide will help you find the best shops for second-hand dolls, and navigate the process of bringing your doll home. Starting off, I’ll explain how to buy Dollfie Dreams from Mandarake, one of the biggest second hand shops in Japan. Probably my favorite shop for second-hand Dollfie Dreams is Mandarake. Their selection is huge- they carry manga, books, anime cels and other toys in addition to dolls and their own line of wigs. At Mandarake you can feel pretty confident the items in their online shop are as described and in decent condition. For the amount of sales they make, the number of problem orders are few and they’re pretty quick to resolve issues. Dolls with stains or parts missing from their fullsets can be had at reasonable prices, unless they are a highly-coveted rarity like DD Tamaki. Mandarake doesn’t have the cheapest prices for dolls, and favorable pricing mistakes are rare, but compared to shopping with a proxy it’s usually an equivalent price and the convenience of browsing makes a compelling case. The best bargains are on like-new doll parts such as standard bodies, busts and hands. It’s also got the best selection of Japan exclusive Dollfie Dreams like from the D’Coord and Dream Choice lines. The English language webshop has all the same merchandise as the Japanese one, although the physical shops in Japan will have items that aren’t online. To browse the doll selection, choose the ‘Toy’ category at top and then select the ‘Dolls’ option. Filters on the left allow you to narrow your search further- I like to exclude sold out items, and to display the max number of items per page. You can also search by keywords, but the item listings can be inconsistent. 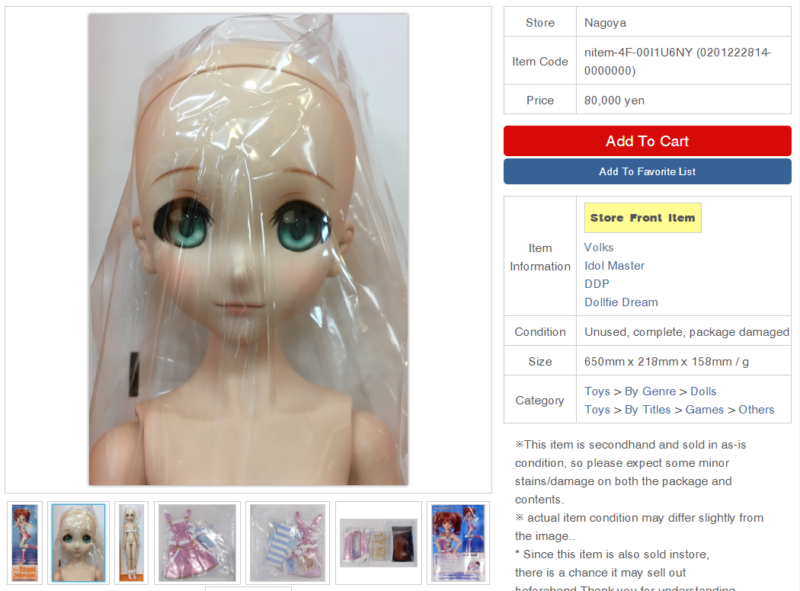 For browsing Dollfie Dreams I prefer to just check the Dolls category regularly, or search for ‘Volks’ item listings in the Dolls section. Occasionally dolls will be listed in the wrong category, but it’s really rare. Mandarake adds new items several times a day, so if you’re actively looking for a recently released doll you should be checking often. Items in your shopping cart are grouped by store, so it’s easy to see how your shipments would be sorted. The ‘Buy it later’ option puts your cart item onto a list on the right edge of the screen, in case you want to fuss with your choices or save it for a future order. One hazard here is that because these items are limited stock they can easily be sold out before you can complete your order. The ‘cancel the order if this item is out of stock’ toggle is useful if you’re primarily after one item, and don’t want to pay shipping for your add-on items if it’s sold out. 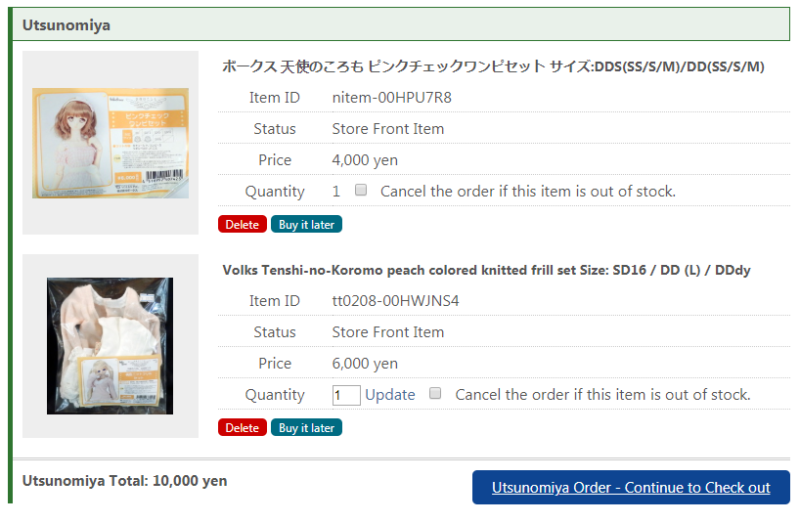 Items listed online can also be sold at the physical Mandarake stores, so you won’t know if your choice is truly available until your order is confirmed, usually 1-5 days after you submit it. Bigger shops like Nakano are better about keeping their stock updated and confirming orders quickly. 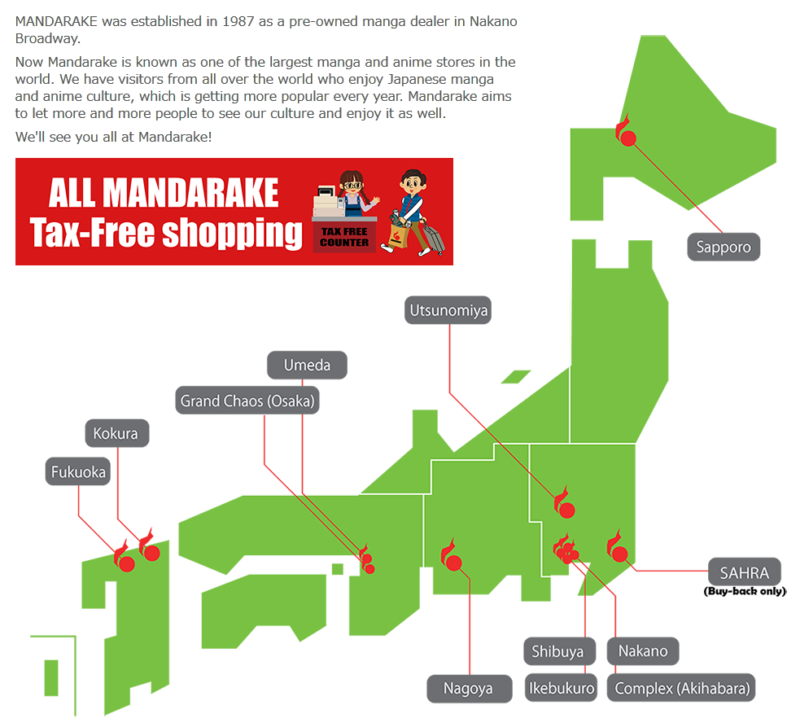 Payment options for Mandarake are Visa/Mastercard, Paypal or Alipay. I usually pay with my Capital One Visa since it’s got no foreign transaction fees, and resolving fraud alerts is easy (and buying an expensive doll from Japan will usually trigger automatic fraud protection!) If for some reason I can’t get my card to work and I’m desperate to make sure my doll doesn’t sell out before I can complete my order, I’ll switch to Paypal. If you use Paypal, be mindful of their exchange rate and fees – there’s an option to use your own credit card’s exchange rate instead and it’s often a better deal. Initial charges will often be labeled as ‘TARO MANDARAKE’ if you need to confirm your purchase through fraud prevention. Once your order is submitted, then it’s time to wait for a confirmation email. When the email arrives, check that the items you ordered are actually in stock (sold out items show x0 quantity) and follow the included link to complete your order and pay shipping fees. Most doll orders ship via EMS which takes 1-3 weeks to arrive. EMS packages require signature for delivery, so if you miss your mail carrier you’ll have to pick up your doll at the post office. If you’re desperately searching for a specific doll, save a list of searchable keywords in English and Japanese so you can quickly check the shop every day. Searching for a doll’s name in English, Katakana and Kanji will cover all the listings for that doll. Check the bottom of an item listing page for ‘Same item in other Stores’. It’s a quick way to find other listings for the same doll, cheaper incomplete/damaged sets, and items your search may have missed. This is really handy for sold-out listings. Use the Alert List function to get emails when a sold-out item is restocked. This option is hidden in your user profile page, and alerts default to ‘off’ after some time, so be sure to maintain it while you’re actively searching for a doll. But could i ask u to write a post about how to buy from japan yahoo auction?? Thanks Ahmed, glad it’s useful for you! Hi! Custom made eyes aren’t available right now. They’ll be on the shop when it’s an option.